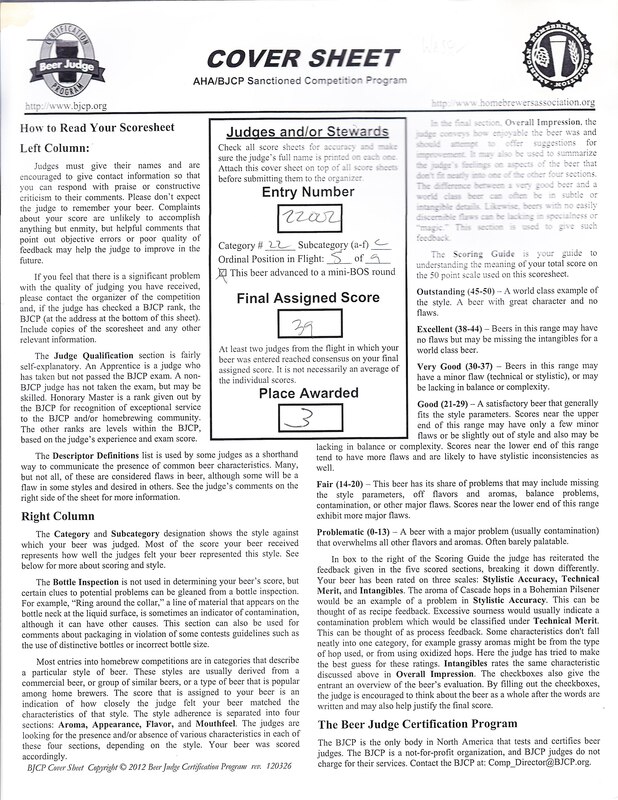 Having recently received my scoresheets from my first ever homebrew competition (Homebrew Alley) I decided to use this week’s Homebrew Wednesday to review the scoresheets and discuss my thoughts on the the judges’ feedback. In turn, my main goal for doing so is to show my fellow homebrewers how they can utilize the blind feedback of homebrew(ing) competitions to improve their brewing. Cheers! Due to the length of the above video I’ve chosen to also breakdown my competition scoresheets in text form so that my reactions to them can be as clearly understood as possible. First I’ll summarize the judges’ comments and then give my reaction/s to them. Judges’ Comments: In terms of score there was a 2 point difference in the taste category of the scoresheet. Both judges enjoyed the interplay with the French and American oak and sweet malt flavors. Though at times the beer tasted a bit sweet and quite oak forward; the oak dryness and flavor at mid palate kept the beer’s drinkability in check. My Reaction: Throughout the weeks prior to dropping my competition entries at Jimmy’s No. 43 I opened a few bottles of this beer and people either were really impressed with it (it won me the people’s choice pint glass at a Bitter and Esters beer swap) or gave me similar feedback to the competition judges. So although I think it’s a good beer, I was quite surprised when I found out that out of the five beers that I entered, my oak aged barleywine was the one that placed in its category. To me it lacks balance in that even after a year plus of aging the oak and bourbon flavors have remain dominant and prevented the base beer from coming through like I feel it should. Moving forward: Now that it has placed in a relatively large competition I will be looking back at my recipe and and aging processes so that I can brew the best oak aged that I can next Fall. Ideally I’d like to scale back the amount of oak chips that I used (4oz) and beef up the malt complexity. Possibly utilizing the malt bill from my more recent batch of barleywine. Scoresheet 2: The Innkeeper English Barleywine 2014-15, Score: 27/50. 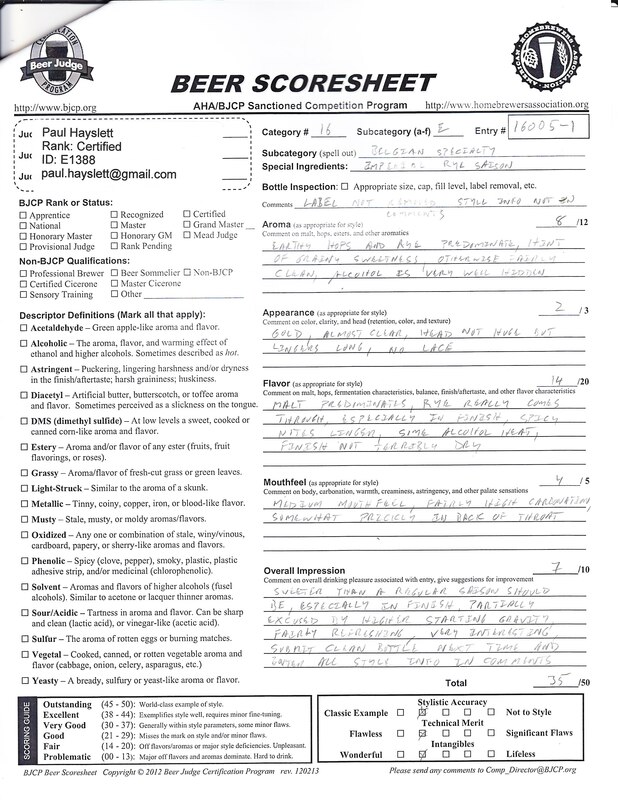 Judges’ Comments: Because I added too much priming sugar at bottling this beer ended up over carbonating and both judges picked up acetylaldehyde and oxidative aromas and flavors which masked and diminished the complex malt character that was present prior to this beer over carbonating. My Reaction: After about four weeks in the bottle I opened a few bottles of this beer with friends and fellow homebrewers and we all loved it. However, our excitement was short-lived because after a few more weeks in the bottle the beer began to over carbonate and develop some off flavors. Once I realized that this was taking place I quickly split my remaining bottles between my keezer and kitchen refrigerator in order to prevent them from carbonating further. After a couple days I took them out and wax sealed them to prevent further oxidation while they age. Moving Forward: I plan on giving this beer at least 6 months post being wax sealed before opening a bottle to check this beer’s progress. When I bottle condition my next big and or malty beer I’ll definitely employ a less if more method when deciding how much priming sugar to use. 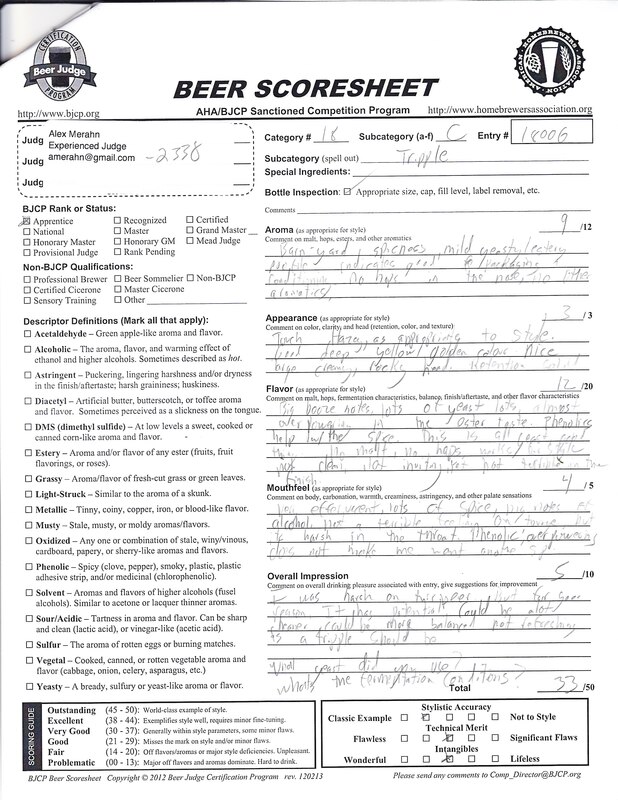 Scoresheet 3: Seven Blessings Imperial Rye Saison, Score 32/50. Judges’ Comments: This beer received the biggest total score total difference (5 points) between its two judges. The first judge (score: 30/50) focused on the rye character of the beer and stated that it was masked some of the saison flavors that he was looking for. However, from some of his other comments I deduced that he may not be so familiar with rye saisons. 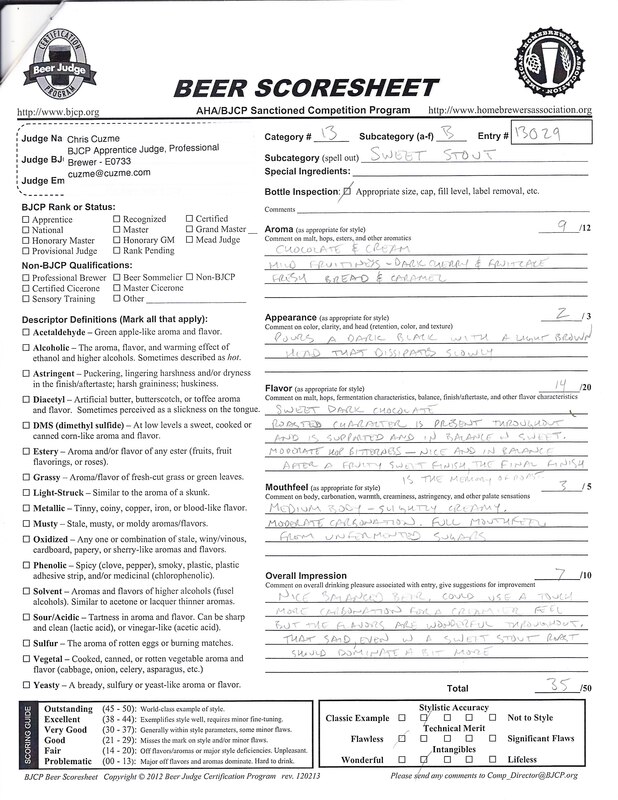 The second judge (score: 35) was able to detect more complexity and enjoyed the beer quite a bit more and found it to be refreshing and a surprisingly good competition entry. However, he did comment that it was a bit sweet in the finish. My Reaction: As stated in the above video I’ve been enjoying how this imperial rye saison is aging and so have my fellow NYC homebrewers. However, the higher abv and spiciness from the yeast and rye seemed to have been too much for one of this beer’s the judges. Moving Forward: I definitely would like to brew this beer again and will consider decreasing the amount of rye (2 lbs, 3.2oz were used in the beer that I entered) to 1.5 or 1.75 lbs in order to allow for my of the classic saison flavors to shine. Scoresheet 4: Holy Beggar’s Breakfast, Chocolate Oatmeal Milk Stout, Score: 34/50. Judges’ Comments: When I was told my a couple of my close homebrewing friends who were able to attend the Homebrew Alley awards ceremony that I’d be happy when the competition results were posted, I was quite confident that my stout would be the beer that placed in its category (13B Sweet Stout). 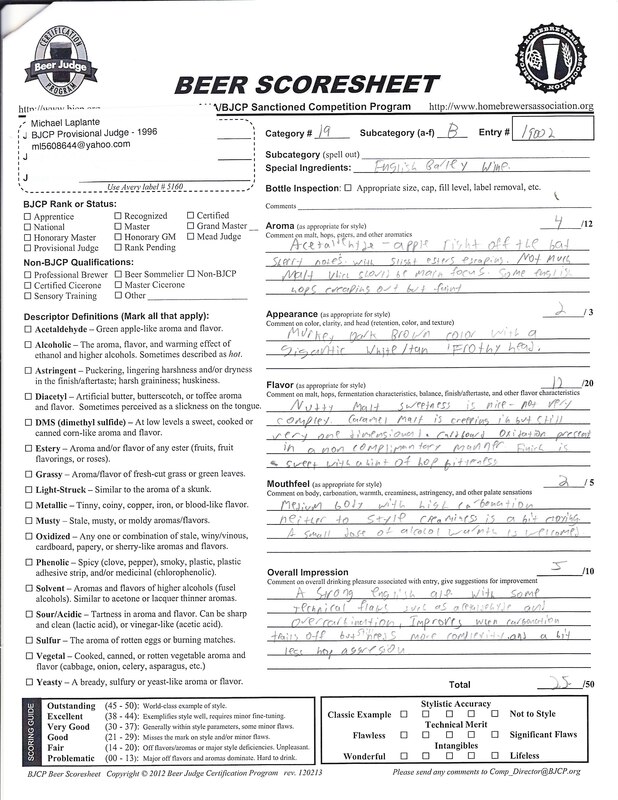 When the results were posted I was surprised yet still happy with the score that this beer received (35 and 33 > 34).Then when I received my score I was happy that one of the judges for this entry was my good friend and pro brewer Chris Cuzme. Both judges enjoyed the balanced complexity of this beer and remarked that a bit more carbonation and roasted malt character were needed to take this beer from great to outstanding. My Reaction: I completely agree with the judges’ comments and will definitely add some of the dark/roasted grains to the mash when I brew this beer again instead of cold pressing all of them. Moving Forward: This was my first time cold steeping dark/roasted grains and after receiving positive feedback from the competition judges and many of my fellow NYC homebrewers; I am glad that I chose to add lactose and the ‘extract’ of cold steeped dark grains to this beer’s recipe instead of adding cold brewed coffee at bottling/kegging time. While a bunch of my other recipes may need a couple more brews to achieve perfection, this one only needs one more tweak to be exactly where it needs to be. Scoresheet 5: Woman of Valor Tripel, Score: 35/50. Judges’ Comments: Because this beer finished with a final gravity of 1.016 I kept my fingers crossed and hoped that the two bottles that I entered were ones that aged well. Thankfully they seemed to have aged well enough to garner a 35/50 in a tough competition category. However, I should note that the 35 came from a 33 and 37 being averaged. The judge who gave this beer a 33 focused on there being too much yeast character and a lack of balance, but made sure to state “I was hard on this beer, but for good reason. It has potential. It could cleaner and more balanced…Not refreshing like a trippel should be.” Though the second judge picked up on the esters, but he enjoyed them quite a bit and picked up on some malt sweetness in the finish (15/20 for Flavor). My reaction: Out of all the feedback/comments that I received from this competition I was most impressed by the first judge’s comments on my tripel. He took all of the beers stats and characteristics into account and gave constructive honest feedback. I hope that in future homebrewing competitions I continue to receive similar comments from judges. Moving Forward: I definitely want to brew this beer again. The biggest change that I plan on making it raising the beer’s fermentation temperature earlier so that it will have a better chance of receiving a lower final gravity. I am also considering adding a portion of the candi sugar that’s in this beer’s recipe on day 2 of fermentation in order to give the yeast a head start on the more complex malted grain derived sugars. If all goes well I’m confident that my next iteration of this beer will be amazing. Have you had similar experiences in homebrewing competitions that you’ve entered? If you have, comment on this post and share them. Cheers! This entry was posted in Homebrewing and tagged bjcp score sheet, breakfast stout, brewing techniques, homebrew alley, homebrewing competition, Imperial Saison, milk stou, New York City Homebrewers Guild, NYCHG, rye saison, Tripel. Bookmark the permalink.